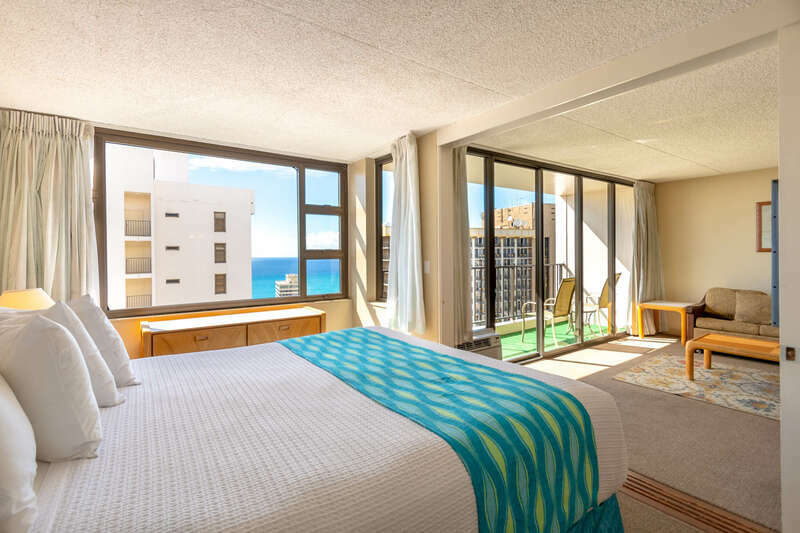 Experience paradise with a fantastic upgraded condo suite only one block from the world famous Waikiki Beach! 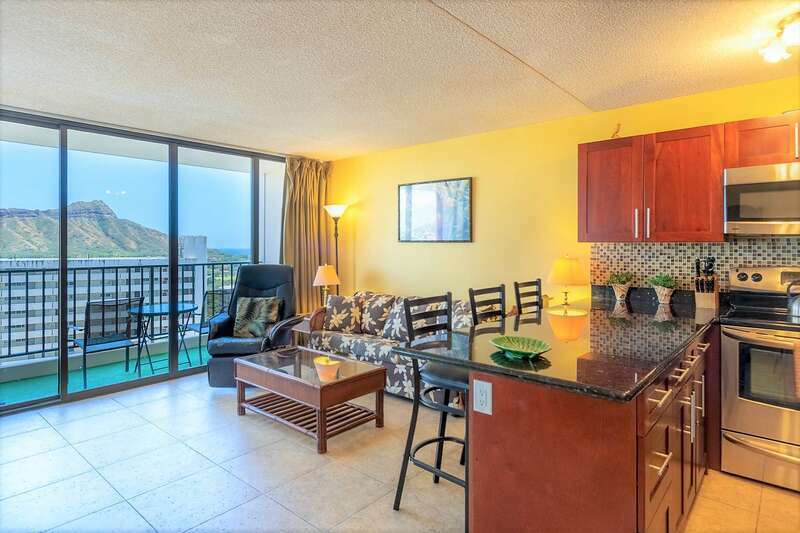 Check out the view of the Diamond Head mountain range and pool from the lanai. The upgrades to this condo include wood cabinetry, granite countertops, and tile flooring throughout. Enjoy a fully-equipped kitchen which includes refrigerator, range, microwave, rice maker, coffee maker, and other kitchen wares. This unit features a dishwasher and toaster oven because, after all, you are on vacation! There is an island with seating for four people. Convenient sleeping arrangements include a queen-sized bed and full-sized bed in the bedroom, and a futon sofa in the living room. A sliding partition door can separate the bedroom and living room for added privacy. This condo features access to the bathroom from the kitchen and the bedroom for your convenience. Save money and enjoy the convenience of a full kitchen, FREE covered parking, TV with cable, FREE in room WiFi and FREE local and toll free phone calling. A/C unit in the living room. 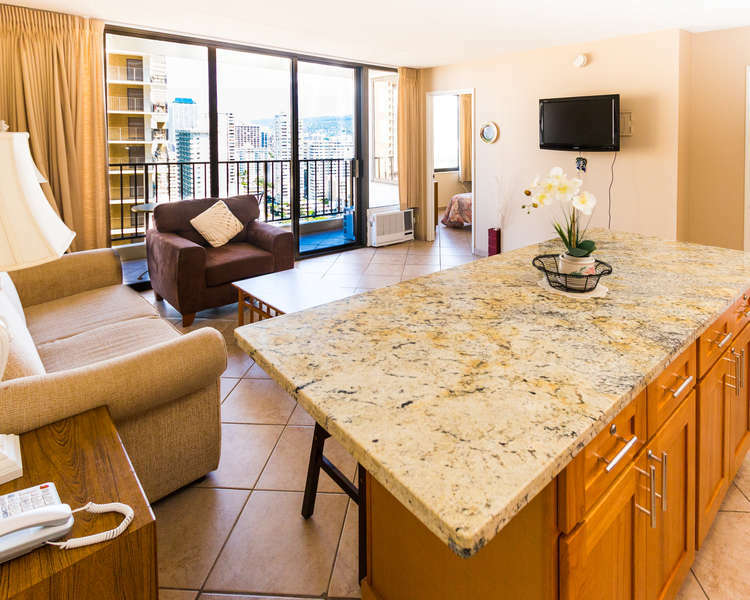 We have gone out of our way to make your stay in Waikiki spectacular so take advantage of all the extras we provide so you can enjoy paradise! Koko Resorts saves you money with standard amenities including FREE parking for one vehicle, FREE WiFi internet, TV with cable, FREE local and toll free phone calling, and an A/C unit in the living room. In addition, all suites managed by Koko Resorts include a full-size kitchen which will save you money and help you eat healthier by not eating out for every meal. Take advantage of all the extras we provide so you can get the most out of your vacation!